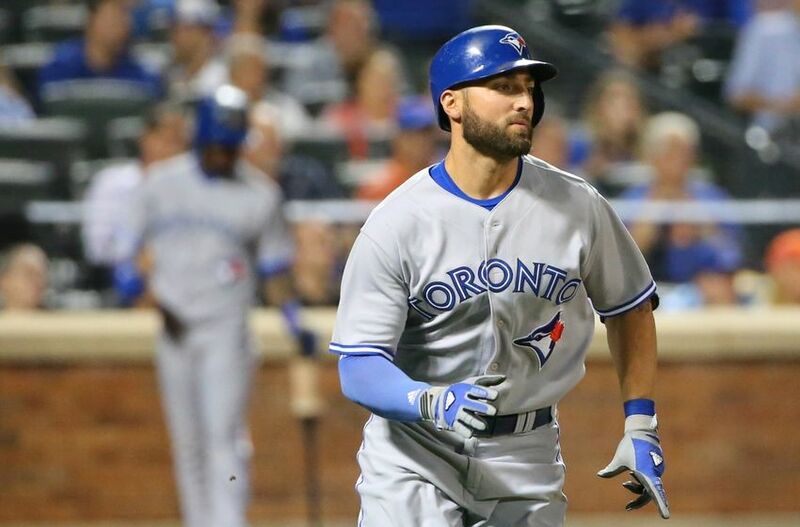 Blue Jays outfielder Kevin Pillar contributed to runs in ways that didn't show up in box score. Imagine the following scenario. Tigers slow-footed designated hitter Victor Martinez leads off an inning with a single and is removed for speedy pinch runner Anthony Gose. Third baseman Nick Castellanos doubles Gose to third and Gose eventually scores on a weak grounder by catcher James McCann. This sequence goes into the books as a run scored for Gose and an RBI for McCann, but Martinez and Castellanos get no credit for the team scoring a run despite contributing important hits. To the best of my knowledge, the kind of run participation by Martinez and Hunter described above is not publicly tracked like runs scored and RBI. For the past few years, I have track this run involvement for all players with the help of play-by-play data at Retrosheet.org. I have tried to account for every instance of a player helping to create a run, whether it be a run scored, run batted in or an indirect contribution for all games where play-by-play data are available. The above example illustrates that the runs scored and RBI statistics do not always give players the credit they deserve for participation in run scoring, but that is not their only limitation. Many analysts eschew these metrics because they measure things that are, to some extent, out of control of the individual batter. Unless a batter hits a home run or steals home, he needs teammates to help him score runs. Even a relatively poor base runner will score a lot of runs if he gets on base frequently and has good hitters behind him. Who bats behind him in the line-up is as important as base running skill in determining how many runs a player will score. The RBI statistic has similar limitations to runs scored. Unless he smacks a home run, a player needs teammates on base in order to drive in runs. If a player has hitters batting in front of him who frequently get on base, then he is more likely to drive in runs than if he has weaker hitters setting him up. Thus, a player on a good hitting team has more chances to drive in runs than a player on a poor hitting team. A batter’s position in his line-up also influences his runs scored and RBI totals. For example, a lead-off hitter usually has fewer opportunities to drive home runs than a clean-up hitter, since the generally weaker 7-8-9 hitters bat in front of him. The RBI leaders at the end of a season are as likely to be the players with the most opportunities as the players most proficient at hitting with men on base. Many mathematically-minded fans would like to see RBI and Runs become extinct in favor of statistics, such as on-base percentage, Weighted On-base Percentage (wOBA) and Batting Runs, which isolate a player's contribution from those of his teammates. Despite the shortcomings of these measures however, most traditional fans still like the concreteness of runs scored and RBI. Players like it too which is understandable. A batter does not want to reach base to improve his on-base percentage, but rather to put himself in position to score a run. Moreover, a batter up with a runner in scoring position is not focused on his slugging average, but rather he is thinking about driving in the run. The runs scored and RBI statistics both have long histories. Shortly after Alexander Cartwright and the New York Knickerbockers established the first set of modern baseball rules, the first box score appeared in the New York Morning News on October 25, 1845. The only statistics that were included in this box score were hands out (Today, they are simply called “outs”.) and runs for batters. Some of the early baseball writers had ties to cricket, a relative of baseball, and early box scores reflected that association. Hits that did not result in runs were not included because, in cricket, one either scores a point by reaching the opposite wicket or is out. The runs batted in statistic was recorded in newspapers in 1879 and 1880 and was an official statistic in the National League in 1891. However, fans complained that the measure was unfair to leadoff batters and too dependent on opportunity and it was quickly dropped. Ernie Lanigan, an important baseball statistician in the early 20th century, personally tracked runs batted in and included the statistic in New York Press box scores starting in 1907. It became an official statistic again in 1920 under the name, “Runs Responsible For”. The RBI statistic gradually gained acceptance and eventually became even more popular than the runs scored metric. Because of their extensive history and their popularity with fans, media and players, the runs scored and RBI metrics are not going to disappear as some in the sabermetric world would like. I would argue that they really shouldn't be eliminated altogether even from the sabermetric community. While they should not be used as overarching player evaluation measures, it is good to know how actual runs were scored along with how they theoretically should have been scored. Note that the above numbers only add up to 65 instead of 66. That is because a player can assist more than one run with one event. The National League leaders are shown in Table 2 below. We saw in Table 1 that the RAS leaders are not necessarily the top hitters in the league. However, the best hitter in the NL - Nationals outfielder Bryce Harper - was also the RAS king with 66. The Detroit Tigers RAS leaders were Miguel Cabrera (47), Ian Kinsler and J.D. Martinez (43). Other top Bengals can be found in Table 3.